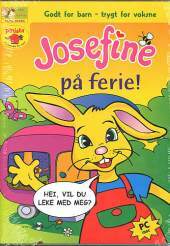 With this CD-ROM game you go with Josephine on her fun vacation! The game contains many educational and fun activities to try to get through the difficult maze. Built in Josefine's camper, you can participate in different activities. You can build jigsaw puzzles, playing cards or join in her fun mind game. In the kitchen you can learn some of Josefine's good food. The game also includes many songs and fairy tales. Suitable for the age group 5-10 years.